Youssef Fares, olive oil specialist at the United Nations Development Programme (UNDP) and assistant frozen goods purchaser at Accor Hotels, will give a business speech. 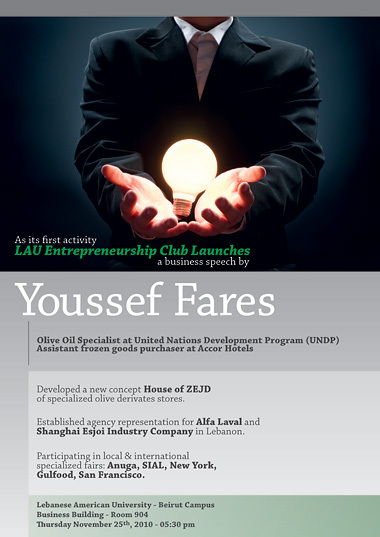 This the first event organized by the LAU Entrepreneurship Club. Developed a new concept House of ZEJD of specialized olive derivates stores. Established agency representation for Alfa Laval and Shanghai Esjio Industry Company in Lebanon. Participated in local and international specialized fairs: Anuga, SIAL, New York, Gulfood, San Francisco. Contact: Ms. Riman Jurdak, Office of the Dean of Students, Nicol GF, Ext. 1101.